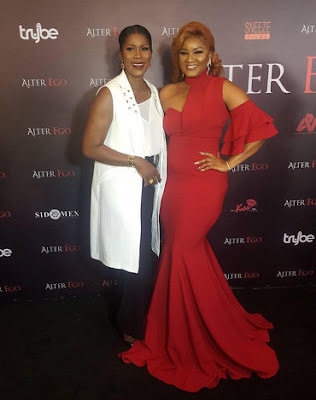 The actress who has been away from the movie scene for years, has starred in a new movie, 'Alter Ego'. Just like her poster, Red is a dominant colour in her look as she is stunning in this red gown. Also peep the blonde hair....nice!! Her colleague, Stephanie Linus came to support but took the casual chic route.